Four Democratic lawmakers have introduced legislation to make medicinal marijuana legal in North Carolina. Eleven other democrats have signed onto the bill. No Republicans indicated their support for the proposed measure at the time of the writing of this article. Rep. Pricey Harrison (D-Guilford), one of the four primary sponsors of the bill, recently told WNCN News that lawmakers frequently hear from constituents who say they suffer from ailments like glaucoma, cancer, and fibromyalgia. They need the option of treatment from cannabis, she argues, something that North Carolina doesn't provide. Rep. Carla Cunningham (D-Mecklenburg), also one of the four primary sponsors of the measure agrees, and told WNCN she believes marijuana should be a choice left to patients. She thinks the bill's passage is unlikely this year, but she's still going to keep her hopes high and contends passing medical marijuana legislation is just a matter of time. Republican House Speaker, Tim Moore, wisely sensing the pulse of the North Carolina electorate, as well as legislators in the State House, concurred the legislation wasn't apt to move this year. "With marijuana, it opens up that whole can of worms," he told WNCN, "I don't see much support for medical marijuana." The Speaker is right. What is more, the legislation should never move forward at any point. Much of the impetus behind medical marijuana initiatives is sympathy for the seriously ill who claim the drug helps them. But Kevin Sabet, a drug policy advisor to three Presidents, Clinton, Bush, and Obama, says in his book, Reefer Sanity, the issue goes well-beyond simple compassion. Sabet rightly argues it should be the Food and Drug Administration (FDA) that properly tests and approves medicines for the public's use, not popular vote. He writes, "[I]t is troubling that some states have decided to bypass that system in favor of one manipulated by political agendas...many states have bypassed the approval process of modern medicine. The result has been widespread abuses." Politicized medicine tends to be bad medicine. 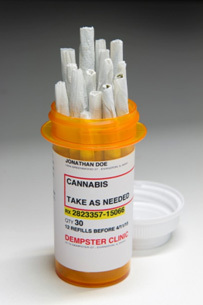 Second, Sabet contends medical marijuana essentially turns the concept of medicine on its head. He notes in California where medical marijuana is legal, you can pay a physician a sort of "rent-a-doc" fee of $45 to $200 to secure a "recommendation" to get the drug at a dispensary. "On Venice Beach in California," he writes, "you can get your 'recommendation' from a bikini clad woman eagerly directing you to a place to buy marijuana wares on the boardwalk. One can get a recommendation by claiming pretty much any illness or discomfort from an array of doctors." It should come as no surprise then that medical marijuana as it stands in many states has "turned into a sad joke," as Sabet phrases it. "A recent study found that the average 'patient' was a thirty-two-year-old white male with a history of drug and alcohol abuse and no history of life-threatening disease. Further studies have shown that very few of those who sought a recommendation had cancer, HIV/AIDS, glaucoma, or multiple sclerosis," he writes. When the medical marijuana issue is properly understood, one can easily see that it violates every sensibility of the way people in this country believe medication should be approved and dispensed. Moreover, "smoking" has never been considered by the medical community as something curative or conducive to healing. Never! In fact, the Institute of Medicine (IOM) says smoking marijuana is an unsafe and inadequate delivery system resulting in harmful effects. Thus, the FDA has approved no medications to be smoked. There's no way to standardize the dose. Morphine is considered a valuable drug, but the FDA has never sanctioned smoking opium or heroin. Likewise, the FDA has approved the use of certain isolated compounds of cannabis as medicine, but concludes there is no sound scientific evidence to support the use of smoked marijuana as a reliable medical treatment. Sabet adds that popular medical marijuana edibles are no better than smoking and are actually more potent. Edibles often create new problems of a wider range than users may be prepared to manage. Moreover, he says few states or localities that sell edibles "help insure sanitation standards in food preparation, much less protect quality and standardized potency." The "edibles industry largely regulates itself," he says. Indeed, medical marijuana not only turns the concept of medicine on its head, but also the concept of public health and safety. Lastly, Sabet argues medical marijuana laws are linked to the expansion of overall use of marijuana recreationally. He maintains, "In most states where voters have approved medical marijuana laws, it has primarily become a license for the state sanctioned use of a drug by practically anyone who seeks it." He also cites an in depth examination by five epidemiological researchers at Columbia University who found "residents of states with medical marijuana laws had higher odds of marijuana use and marijuana abuse/dependence than residents of states without such laws." Unquestionably, state endorsement of marijuana as medicine effects not only increased access to the drug, but also reduces the negative moral stigma of its use among old and young alike. So what's behind such reefer madness as medicine? It's very simple: It's a first and crucial step toward legalization of marijuana recreationally. If people are to accept something largely rejected as inherently dangerous or immoral, then the way to drop defenses is to attach it to some perceived good. It's the same tactic the Serpent used on Eve when he told her that eating the forbidden fruit would make her wise and as God himself. First, he intellectually planted a doubt about whether the forbidden was really a bad thing, and then he illegitimately appealed to Eve's emotions, which precipitated her foolish choice that turned into a chain. Medical marijuana only obscures our state and nation's vision of true medicine and the government's God-given mandate to protect its citizenry. Stoned and too relaxed on the notion, critical considerations get neglected and lost in the haze. Whenever lawmakers in North Carolina, as well as any other state, are confronted with the prospect of legalizing medical marijuana, they should either snuff it out or let the proposal go up in smoke. The author gratefully acknowledges WNCN News and "Reefer Sanity: Seven Great Myths About Marijuana," by Kevin A. Sabet, as sources for most of the information contained in this editorial.